Rabbits are the greenest livestock you can raise on your homestead! The other day, while I was sifting Bunny Berries, I was thinking that the only by-product of rabbits that is not green are the polypropylene bags that the feed comes in. They aren’t very biodegradable but they are re-usable. I have used them for sandbags, putting wood scraps in for kindling, covering for the outside rabbit hutches in the winter and as small tarps, I have seen many people make some nice re purposed shopping bags and even raincoats from these bags, and then it hit me, I had an idea! I turned them inside out (to have a nice clean white bag) made a stencil and sprayed one side of the bag with BUNNY BERRIES and The other with RISE AND SHINE RABBITRY filled them up with 12+ gallons of the best manure/ fertilizer to sell as bagged manure to local organic gardeners. 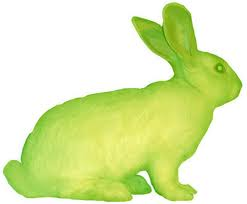 But rabbits are also a green choice if you eat meat. So if you are going to eat meat, raising animals at home is the greenest way possible! So for a great sustainable healthy meat supply start raising rabbits today! They’re efficient in the amount of food required for the amount of meat produced compared to other larger livestock. With the larger livestock you are getting into much larger greenhouse gas emissions issues. One doe might have seven or more rabbits, each of which yields 2 to 3+ pounds of dressed meat. So that’s roughly 20 pounds of meat per litter, and a single doe might have three to six litters a year depending on your breeding schedule. Rabbits come in a convenient meal-sized package, so you do not need to use electricity to freeze the extra meat for later use, like you would for larger livestock! Store it on the hoof so to speak. A domesticated rabbit will eat garden vegetables and even dandelion leaves (Check the FEBURARY archives for SAFE FOOD LIST FOR RABBITS) and so much more! It is possible to raise and feed 2 does and a buck with nothing but what you can produce or find on your own land. Hay is the mainstay of a healthy rabbit diet and is locally grown in most states (You can also grow your own on a small scale). Rabbits also enjoy eating parts of vegetables humans don’t want to consume like carrot tops, radish tops,peelings, and beet tops and much much more. By feeding your rabbits local you can reduce emissions and support the local economy. They’re quiet and won’t disturb the neighbors so no noise pollution. It may seem mean to kill a rabbit but it is far better than buying an inexpensive, prepackaged steak. Here’s why! Many people don’t think about the environmental impact or an animal’s quality of life when buying processed meat, such as beef and pork from large-scale, crowded, commercial operations that rely on antibiotics and hormones. Rabbits are usually raised locally without medication and antibiotics and can be purchased at a local farmers market thus create less food miles!